Looking for a mind succumbing to CTE. The Schuyler sisters are going downtown and slummin’ it with some sports fans. 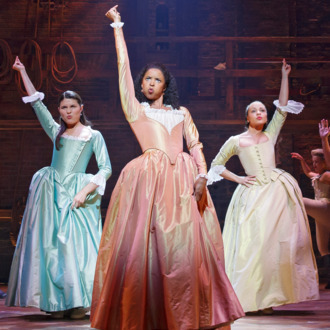 Renée Elise Goldsberry, Phillipa Soo, and Jasmine Cephas Jones, who originated the roles of the Schuyler sisters in Hamilton on Broadway, will perform “America the Beautiful” at this year’s Super Bowl, on February 5. They’ll be joined by Luke Bryan, who will perform the national anthem, and Lady Gaga, who will perform at the halftime show. In exchange for the Schuyler sisters’ performance, we assume Tom Brady will be doing a Music Man medley at next year’s Tonys.